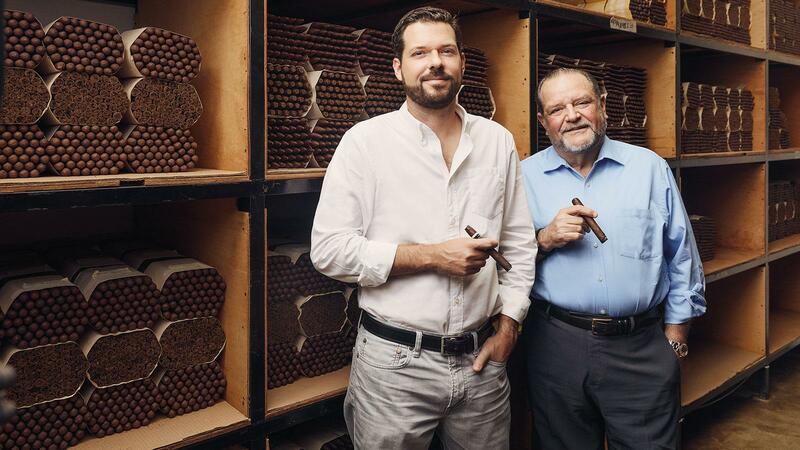 The father-son team behind Joya de Nicaragua: Dr. Alejandro Martínez Cuenca (right) and his son Juan Martínez. “The guards are superstitious at night,” says Juan Martínez. The president of Joya de Nicaragua is standing in a cavernous back hallway on the first floor of his company’s cigar factory in Estelí, Nicaragua. He explains that the guards who patrol the grounds at night claim to see restless spirits, the ghosts of factory workers slain during the Nicaraguan revolution. That was the end of the 1970s, when the Nicaraguan dictator Anastasio Somoza tried—and failed—to crush the Sandinista revolution. He ordered his men to bomb Estelí, and the Joya de Nicaragua factory was hit in the strike. Soldiers arrived shortly after, marching through the rubble and debris in search of guerrilla fighters. They entered the factory with their weapons loaded. Suspected dissidents were ripped from their work stations, forced against a wall. A volley of gunfire, and then it was quiet. Bombardment and bloodshed did not bring an end to Nicaragua’s oldest cigar brand. The factory endured the war, and a five-year-embargo banning Nicaraguan goods from America. This year, Joya de Nicaragua celebrates its 50th anniversary. Martínez heads to a brightly lit conference room where his father, Dr. Alejandro Martínez Cuenca, sits smoking a cigar. Cuenca, 71, acquired the factory in the early ’90s and has remained at the helm of the company ever since. The Joya de Nicaragua cigar brand was created in 1968 by Juan Francisco Bermejo and Simón Camacho, the founders of Nicaragua Cigar Co., which operated out of a small factory in downtown Estelí. In the early 1970s, the brand prospered and became a commercial success in the United States. But the brand’s international success also attracted the attention of Somoza, who strong-armed control of Nicaragua Cigar Co. away from the original owners. Under Somoza’s watch, the brand continued to grow in popularity. 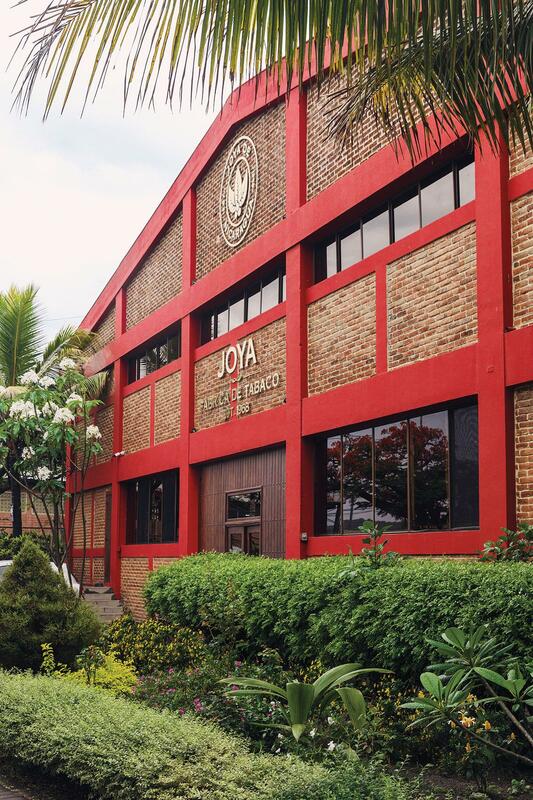 Between 1976 and 1978 the factory was producing 9.2 million Joya de Nicaragua cigars a year. Demand grew so rapidly that Somoza moved production of the cigar to a larger factory—the massive brick building it calls home to this day. The Joya de Nicaragua Factory in Estelí, Nicaragua. But in 1978, Nicaraguan civil unrest and rising tensions between Somoza and an opposing political faction called the Sandinista National Liberation Front reached a boiling point. There were riots in the streets. Somoza bombed his own cities. M4 Sherman tanks rolled through the wreckage of broken buildings and helicopters circled the smoke-filled skies. Violent protesters set fire to Somoza-owned businesses, including the Joya de Nicaragua factory. To make matters worse, it became impossible for Nicaragua Cigar Co. to market its cigars in the United States due to a nationwide ban on all Nicaraguan imports. In an effort to undermine the newly formed Sandinista government, the U.S. imposed an embargo against Nicaragua in 1985, prohibiting all trade between the two countries until it was lifted in 1990. During those years, Nicaragua Cigar Co. sold its Joya cigars elsewhere, planting a strong foothold in the European market that persists to this day. 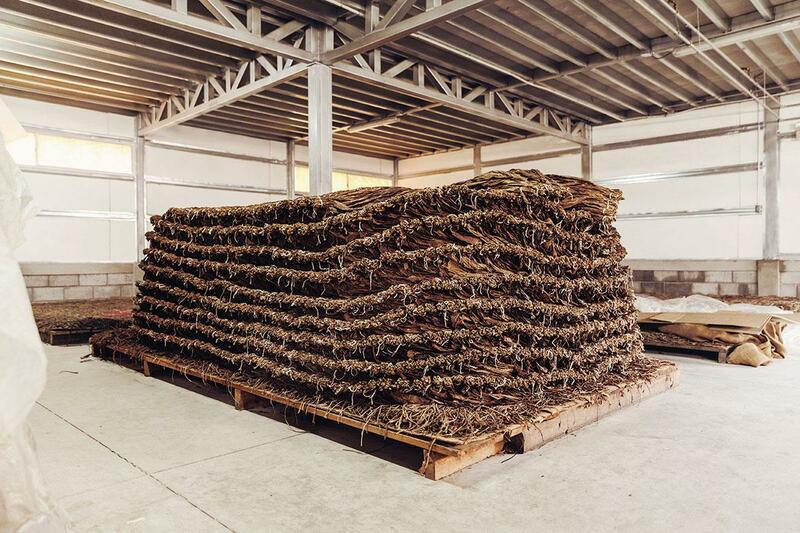 Tobacco leaves inside the factory are arranged for fermentation in a pilón. Despite the brisk sales to Europe, Joya de Nicaragua struggled financially during the ’80s and the early ’90s. It missed selling cigars to the U.S., the world’s largest cigar market. Representatives from the factory reached out for assistance to Alejandro Martínez Cuenca, who was governor of Nicaragua’s Central Bank at the time. Cuenca saw a future for the struggling company. Cuenca’s Tabacos Puros de Nicaragua rented, then took over, Nicaragua Cigar Co. in 1994. By that time, the Nicaraguan embargo was over, and Cuenca knew it was essential for the company to reenter the U.S. market. But there was a big problem. The dictator Somoza had left a dagger in the back of Joya de Nicaragua. Before he fled the country, Somoza sold the trademark for Joya de Nicaragua to an American company called Oppenheimer & Co. Oppenheimer found a different business partner to make Joya de Nicaragua cigars for them—one based in Honduras. It sounds bizarre, but during the 1980s, Joya de Nicaragua—the Nicaraguan puro whose name translates to “The Jewel of Nicaragua”—was being rolled in a different country with an entirely different blend of tobaccos. A cigar buncher works with filler and binder tobaccos in the rolling gallery. “At the time, this company had no knowledge that in the United States there were cigars being sold with the name Joya de Nicaragua manufactured in Honduras,” Cuenca says. “So my task was—once I decided to buy the company in 1994, after I had been running it for a year under a contract of rental of the facility—to get together with those that owned the trademark and try to negotiate an agreement.” In 1994, he met with executives from Hollco-Rohr, a company that had acquired the U.S. distribution rights to Joya from Oppenheimer. Cuenca made a deal, and the Joya factory was once again able to produce Joya de Nicaragua cigars for the U.S. But Cuenca wasn’t finished. He wanted to buy back the U.S. trademark and bring it home, where it belonged. But he would have to negotiate with yet another company. Tabacalera Cigars International had acquired Hollco-Rohr, and with it, the U.S. Joya de Nicaragua trademark. (Through a series of mergers and acquisitions, Tabacalera would one day merge with France’s SEITA and become Altadis S.A., which makes non-Cuban Montecristos and Romeo y Julietas under its U.S. subsidiary.) Cuenca acquired the brand in 1998, and finally, the Joya de Nicaragua trademark was back with his company. The name of the cigar was a homage to the golden years of the company. Those bright, few years during the 1970s before the hardships began. The cigar was a triumph for the company. A growing demand for Nicaraguan cigars, and in particular fuller-bodied cigars, propelled Antaño to critical acclaim. In the December 2011 Cigar Aficionado, the Antaño Machito, a small cigar packed with muscle-bound tobacco, scored 92 points. In the coming years, the American obsession with powerhouse smokes from Nicaragua would only continue to grow, allowing many new cigar companies to take root and expand in Nicaragua. Throughout the 2000s, the proliferation of new cigar companies entering Nicaragua, as well as increased demand for fuller-bodied cigars, led manufacturers to roll increasingly stronger, spicier smokes. Cuenca admits that, by today’s standards, Antaño 1970 would no longer be considered the strongest cigar on the market, but feels it was instrumental in starting a trend that persists to this day, and strengthened Nicaragua’s cigar industry overall. In 2009, Tabacos Puros de Nicaragua was renamed Joya de Nicaragua, to better align the company with its flagship brands. Shortly after, Juan Martínez, Cuenca’s son, began to take a more active role in the company, and in 2013 he was named Cuenca’s right hand man, taking on the role of president at Joya de Nicaragua. Tasked with driving the company forward into a new era, Martínez spearheaded the launch of the modernized Joya cigar brands. First Joya Red was introduced in 2014, followed by Joya Black in 2016. Last year, the Joya Black Nocturno ranked No. 22 on Cigar Aficionado’s Top 25 Cigars of the Year list. And this year, at the International Premium Cigar and Pipe Retailers trade show, the company plans to introduce the Joya de Nicaragua Cinco Decadas, a cigar meant to commemorate Joya’s 50th anniversary. 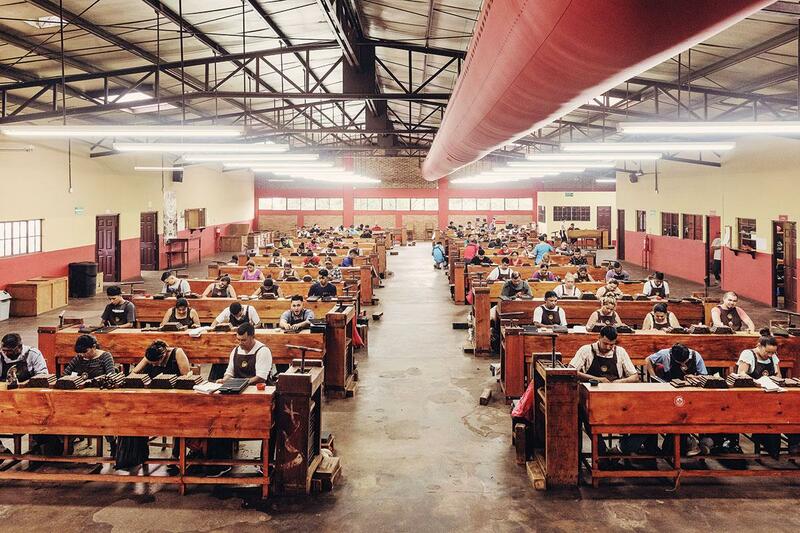 The main rolling room at Joya de Nicaragua, a brand that was first made 50 years ago. “We wanted to celebrate this 50 years with a note of optimism to the industry. A realization that what we have achieved both as a company and as an industry is a story to be told,” Cuenca says. Martínez leaves his father’s side and takes a staircase up to the second floor of the cigar factory. The rolling gallery. 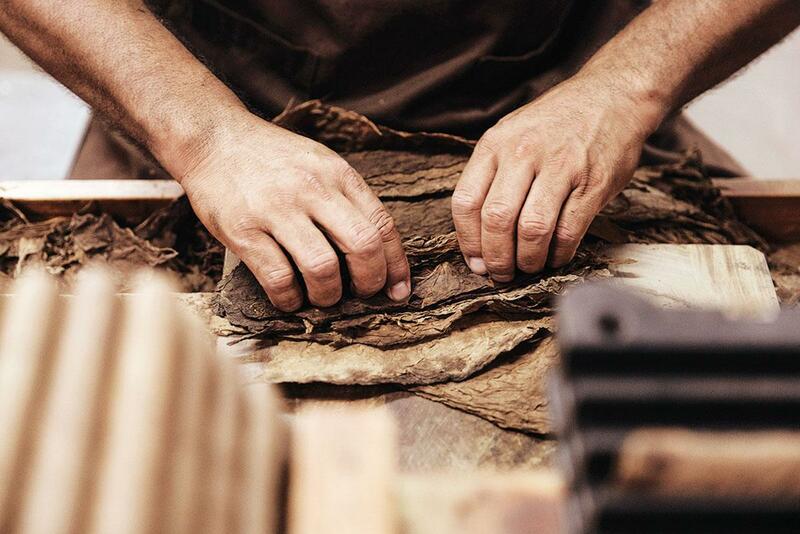 A dull murmur of hands crafting cigars, 68 pairs of rollers working tobacco leaves. Sunlight drifts through the windows at the front of the factory, falling on the shoulders of the workers seated there. It’s a scene far removed from the company’s turbulent past, but there are still traces of it here and there. Bullet holes in the front wall of the factory. Scars in the floor where a bomb ripped through the concrete. The past is never really dead at Joya de Nicaragua. It’s built into the identity of the cigar brands, it’s etched into the walls of the factory. And late at night, after the factory workers have gone home, history seems to come alive again, if only for a moment, when the guards take up their posts, their superstitions running wild. Recently, they have reported hearing unexplainable noises. In the dark and quiet halls they have heard the echo of chavetas scraping against each other, the quick strike of metal on metal, only to turn around and see nothing there—an empty cigar rolling table. A wooden chair. Pale moonlight slanting through the windows on the cold concrete floor.